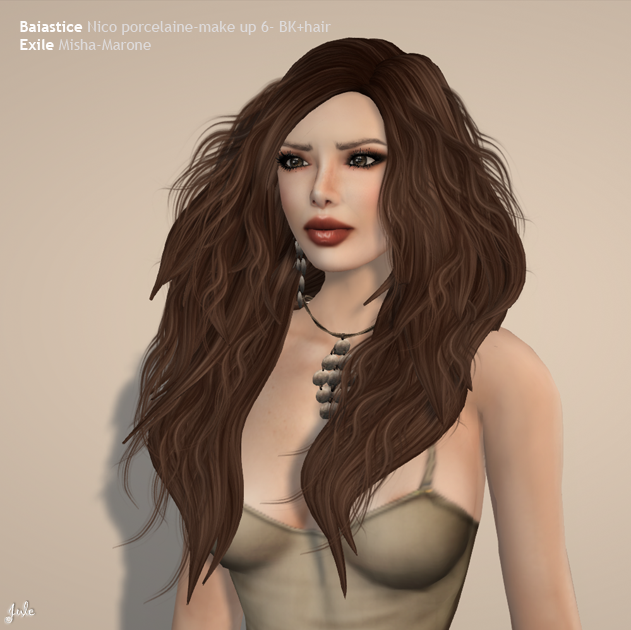 Skin: Baiastice Nico-porcelaine-make up 10- BL+hair New! Shrug: Mimikri Yvette Fringe Shrug sand New! Dress: Mimikri Yvette Dress sand New! Hair: Exile Misha in Marone and Cranberry New! Hair: Exile Meg in Californa and Midnight New! Skin: Baiastice Nico-sunkiss-make up 3- BK+hair New! Jacket: Sweeter Than Candy Cassidy Coat Gray New! Skirt: Apple May Mimi New! Earrings & Necklace & Bracelet: Apple May Crater Jewelry New! Watch: Addiction Grandpa's Pocket Watch Necklace New! Baiastice - Sissy Pessoa has created new skin line. Many skin tones and options avaible, here a few samples. Sweater: RONSEM Moko Sweater - black New! Skirt: RONSEM Denim Skirt2 - black New! Tights: Mstyle Stars Tights - Cerise 1 Gift! Boots: Crazy Veracruz Mesh Boots New! Bag: TokiD Stumble bag - light New! Labels: Crazy, KOSH, Kyoot, LAQ, Lelutka, MIU, TokiD, tulip. Dress: T.Whore convict jacket truffle New! Hair: Vanity Hair Lady Boy-Auburn New! Boots: Crazy Charro Mesh Boots New! Earrings & Necklace & Ring: Apple May Sunburst Jewelry - Spring New! everything glares and sparkles like a sea of diamonds. Truly surreal, shining and dreadfully cold. waiting for our frozen limbs getting alive again. Hair: TRUTH Blair - fudge New! Skirt: Mimikri Charm Chain Skirt dune New! Gloves: Hermony Leather Gloves Fingerless Burgundy Dollarbie! Boots: Maitreya Mesh * Radical Boots * Snow New! Hair: Exile Madison Bottle Blonde New!